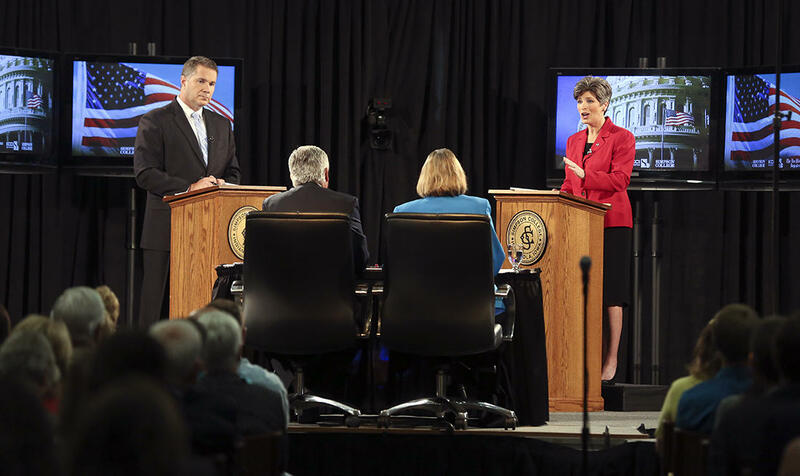 Joni Ernst, republican candidate for U.S. Senate, speaks during a debate with democratic candidate Bruce Braley. The debate came a day after the first Des Moines Register Iowa Poll Showed Ernst in the lead by 6 points. The two major party candidates for Iowa’s open U.S. senate seat debated last night at Simpson College in Indianola. The debate came a day after the first Des Moines Register Iowa Poll of the general election. It shows Democratic Congressman Bruce Braley trailing his Republican opponent State Senator Joni Ernst by 6 points. Braley had the first opening statement and after a quick introduction says there are big differences between him and Ernst. “This election is about a clear choice between moving Iowa forward and following a radical tea party agenda that’s going to take us backwards,” Braley said. Ernst took a similar approach to an opening statement: a brief introduction and the differences as she sees them. Ernst played up her record in the National Guard and called out Braley for missing a large number of Veterans Affairs committee hearings. They were asked about foreign policy, immigration, taxes and the minimum wage. Braley said the most important thing for Iowa’s next U.S. Senator to do is to fight for the state’s working class families and his opponent’s stance on the minimum wage does NOT keep those families in mind. But Ernst said what’s right for Iowa’s minimum wage is not necessarily right for California or New York. Moderators of last night’s debate took questions from viewers. Des Moines TV Anchor Kevin Cooney said many questions for Ernst were about what she believed about climate change. 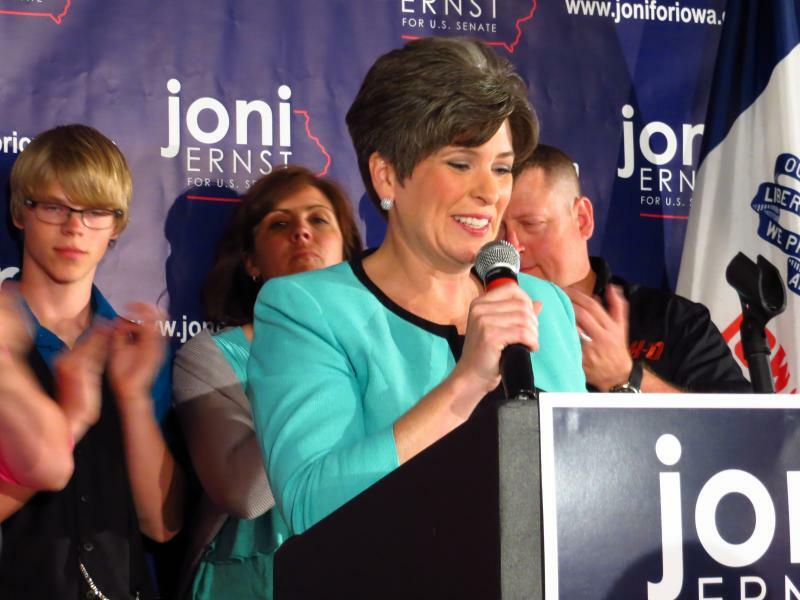 Ernst said her opponent agrees with those EPA regulations. Braley said Iowans want a strong agriculture economy. “If you don’t accept that this is a real problem, which it sounds like Senator Ernst doesn’t, many Iowa companies believe it strongly and if we don’t do something it’ll harm our economy,” Braley said. On the Affordable Care Act, Ernst said every Iowan deserves access to healthcare, but Obamacare is not the answer. She said it’s increasing taxes and costing jobs. Braley said the ACA isn’t perfect and says it can be improved. But their most confrontational interaction of the night came when each accused the other of being beholden to special interests. “So remember that please that you are running against me, not against any of these other groups. 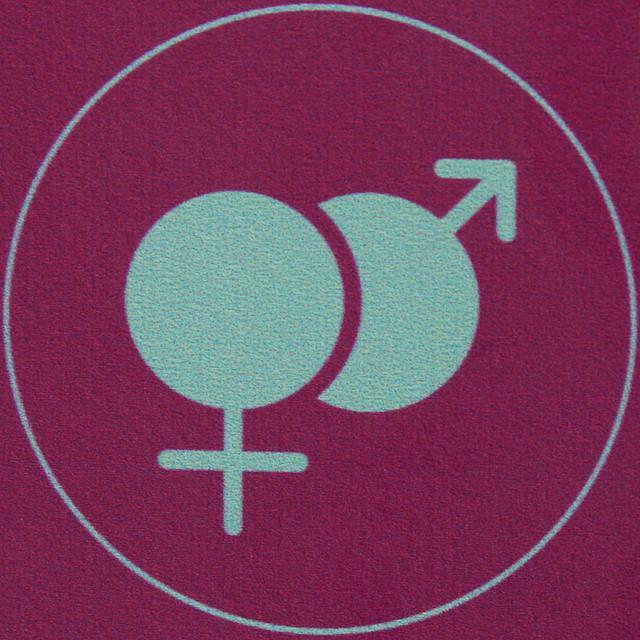 You are running against me,” Ernst told Braley. “I realize that and Senator, President Obama’s name is not on the ballot and I’m not going to owe president Obama anything on Election Day. 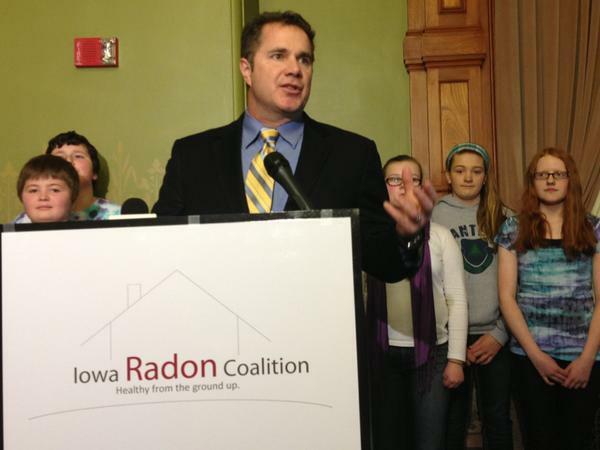 You’re going to owe the Koch brother everything,” Braley said. “I owe nobody anything except these Iowa people,” Ernst fired back. Drake Political Science Professor Dennis Goldford was in the audience and said neither candidate really won the debate. Godlford said Braley’s performance does give him a chance to right the ship given the weekend poll that showed Ernst in the lead. Braley and Ernst have two more scheduled debates. Republicans have their eye on a handful of seats they need to pick up to take control of the U.S. Senate this November. One is longtime Democratic Senator Tom Harkin, who’s retiring later this year. The open seat pits Democratic Congressman Bruce Braley against Republican State Senator Joni Ernst. Polls show the race neck and neck as the candidates have just more than two months left to campaign. After pulling ahead late in a crowded field, State Senator Joni Ernst won the Republican nomination for the U.S. Senate to replace retiring Democrat Tom Harkin. Today’s Quinnipiac University poll shows if the election for U.S. Senate were held today, 44 percent favor Democrat Bruce Braley and 40 percent favor Republican Joni Ernst. Iowa will hold its primary on Tuesday, June 3. Democratic Senator Tom Harkin is retiring and that’s set off a domino effect of politicians vying for higher office and this midterm election could make history if voters send a woman to Washington. It’s just one of two states that have never done so or elected a woman as governor; the other is Mississippi. 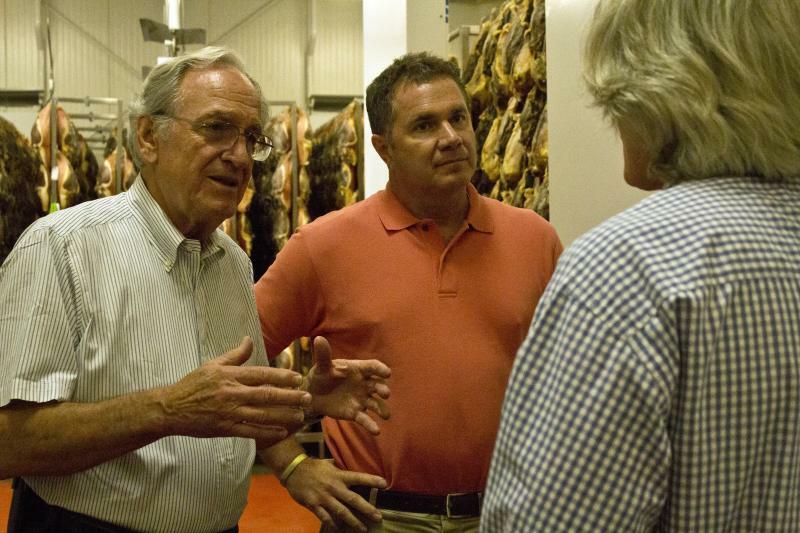 Democratic Senator Tom Harkin announced last year he was retiring. It’s been decades since Iowa’s had an open senate seat. 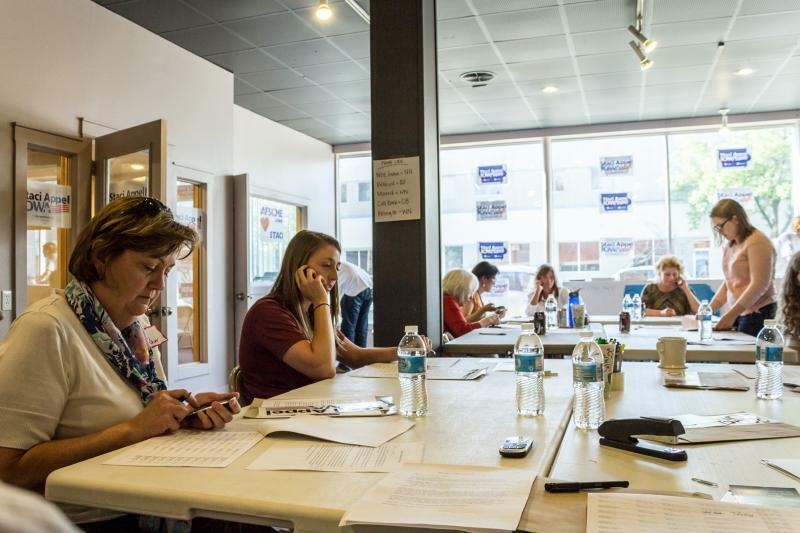 There are five candidates on the Republican side: State Senator Joni Ernst, Former Energy Executive Mark Jacobs, Ames businessman Scott Schaben, Morningside Economics Professor Sam Clovis and former U.S. Attorney Matt Whitaker.